Thierry Aubin was ranked first in the Concours Général de Mathématiques in 1961 and, in the same year, he entered the École Polytechnique in Paris where he studied mathematics. He was taught by André Lichnerowicz and he asked him if he would be his doctoral advisor. Aubin submitted his thesis and graduated with a doctorate in 1969 but, in the previous year, he had already been appointed to the University of Lille. He remained at Lille for five years before, in 1973, being appointed as a professor at Paris VI, the Pierre and Marie Curie University. His graduate course at the Pierre et Marie Curie University in 1976-77 was designed to present several theorems published by him in 1976; it had a remarkable intensity. I remember Aubin only presented what was strictly necessary, seldom consulting his notes .... Having read the wonderful book "Field Theory" by Lev Landau and Evgenii Lifshitz, I was in familiar territory. He included some results outside those which were directly relevant, but gave little explanation or commentary, allowing each student to work alone on the meaning and scope of the course. Hidehiko Yamabe published Conformal deformation of Riemannian structures on compact manifolds (1960) in which he proved the following: given a compact Riemannian manifold without boundary of dimension greater than two with a given metric, there exists a metric with constant scalar curvature which is conformal to the given metric. 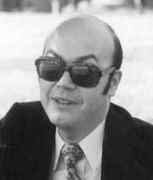 However, Neil Trudinger published Remarks concerning the conformal deformation of Riemannian structures on compact manifolds in 1968 in which he pointed out a problem with Yamabe's proof. Sadly, Yamabe had died aged 37 in the year his paper was published so others had to work on the problem. This became known as the 'Yamabe problem' and it was something to which Aubin made substantial contributions. His fundamental papers Métriques riemanniennes et courbure Ⓣ (1970), Equations différentielles non linéaires et problème de Yamabe concernant la courbure scalaire Ⓣ (1976) and Meilleures constantes dans le théorème d'inclusion de Sobolev et un théorème de Fredholm non linéaire pour la transformation conforme de la courbure scalaire Ⓣ (1979) were fundamental in solving the Yamabe problem. In 1954, in The space of Kähler metrics, Eugenio Calabi made his famous conjecture. This claims the existence of a Kähler-Einstein metric on a compact Kähler manifold, having a prescribed volume form. The analytic problem requires one to prove the existence of a solution of a highly nonlinear (complex Monge-Ampère) differential equation. Aubin proved an important special case of the Calabi conjecture in Equations du type Monge-Ampère sur les variétés kählériennes compactes Ⓣ. He published two papers with this title, the first announcing his results in 1976, and the second giving full details two years later. In fact in 1978 it was Shing-Tung Yau who extended Aubin's results and completed the proof of the Calabi conjecture which earned him a Fields medal in 1982. Professor Aubin is widely known for his contribution to the solutions of the Calabi conjecture as well as the Yamabe problem. His work on the prescribed scalar curvature problem is perhaps not as well known but has had wide influence on the development in this area. To understand the scalar curvature equation on the sphere, he introduced the balancing condition on the conformal factors, and provided an improvement in the Sobolev inequality for such factors. This became the basic tool of the compactness argument for a lot of subsequent work on this equation and later lead to the solution of prescribing curvature problem with no assumption on the symmetry of the curvature. Professor Aubin has also written several books about geometric PDE that have a wide influence in geometric analysis. We consider Professor Aubin as one of the anchor in the field of geometric PDE in recent decades. He and his work will be in our memory. As one of the major contributors to the resolution of nonlinear problems in geometry, Thierry Aubin has focused this monograph on a few significant questions on which he has been involved personally, rather than writing a broad treatise. ... like its predecessor, gives an amazingly thorough survey of the state of the art at the time of its writing. With the exception of the chapter on harmonic maps ... all the major results are carefully and accurately stated, and all the main steps in the proofs are described. Although few of the details of the proofs are spelled out, copious references to the literature make it a straightforward (though by no means easy) matter for the interested reader to fill in the details when needed. The result is a book whose completeness and scholarship will make it a valuable reference and literature guide for working mathematicians, as well as a comprehensive survey for beginners who wish to get an introduction to this vast and rapidly expanding field. This book provides an introduction to differential geometry, with principal emphasis on Riemannian geometry. It can be used as a course for second year graduate students. The main theorems are presented in complete detail, but the student is expected to provide the details of certain arguments. ... The aim of this book is to facilitate the teaching of differential geometry. This material is useful in other fields of mathematics such as partial differential equations, to name one. We feel that workers in PDE would be more comfortable with the covariant derivative if they had studied it in a course such as the present one. Given that this material is rarely taught, we feel that it requires a substantial amount of effort, especially since there is a shortage of good references. It covers topics every working mathematician (or theoretical physicist) ought to know: tensorial, differential and integral calculus on smooth manifolds, and basic Riemannian geometry. The style is very clear and concise, and the emphasis is not on the widest generality, but on the most often encountered situation. This makes it a much more approachable text than many other traditional sources. The inclusion of a large number of interesting exercises (some of them with complete solutions) enhances the educational value of this book. To conclude, I believe this is an excellent textbook for a first course on basic differential geometry, very helpful to both the instructors and their students. Aubin was honoured with the award of the Prix Servant from the Academy of Sciences in 1982. On 19 March 1990 he was elected as a corresponding member of the Mathematics Section of the Academy of Sciences. On 18 November 2003, along with Laurent Lafforgue and Marc Yor, he was elected a full member of the Academy. Two of his supporters for election were Shiing-shen Chern and Louis Nirenberg. Thierry Aubin was a very important mathematician whose work had great influence on the fields of Differential Geometry and Partial Differential Equations. He was instrumental in bringing to bear on geometric problems the powerful methods which were developed to handle nonlinear elliptic and parabolic PDE during the 1950s and 1960s. Aubin applied these methods in novel ways to fully nonlinear equations, and to delicate semilinear variational problems. In the past fifty years there has been a surge of work on problems that involve the interplay of differential geometry and analysis, particularly partial differential equations. Thierry Aubin was one of the true leaders. He had important insight on how to reduce geometry problems to proving fundamental inequalities. These will have a permanent place in mathematics. Thierry Aubin was an excellent mathematician, a great geometer. His mind was clear, his exposition allowed readers to immediately tackle difficult subjects and gave them the illusion to quickly reach advanced research in highly technical and complicated areas. His books show the talent of a magician who invites you into an area as if you had always been there, as if you did not need to enter it. ... Thierry Aubin was also a complex human being in search of new horizons. He sought, and found I believe, friends all over the world: he had students (many of them were his personal friends) both French and also from North Africa. He has travelled all over the world, his name and his work is known and respected everywhere. Aubin had a complex personality; a man of great mathematical talent ... Very smart, he was a man of originality, rather secret, who spoke little, but knew how to get to the fundamental. In his lectures and his books, he missed out a number of steps in the calculation, which gave colour and sweat to those who wanted to enter the fun but difficult area of analysis on manifolds. ... If I have to add something, it's just that knew how to appreciate beauty in its most diverse forms. Thierry Aubin soon experienced his first serious health problems. Two years after my PhD, I was assigned to the Dieudonné Laboratory. While in Paris, I asked him once if he would allow us to organize a symposium in his honour. He declined, his health would not allow him to participate. Now we will consider perhaps the idea of a symposium on the legacy of his mathematical interests, interests shared by the best geometric analysts in the world.